Poseidon Industries, LLC, premiere manufacturer and maker of equipment for stone industry, launches high-quality and large variety of stone fabrication equipment for marble and granite industry. Humans have been shaping stone and using it to errect buildings since around 5000 BC. The industry has come a longway since then, with the development of innovative tools and techniques. Now, a new player, Poseidon Industries is taking the US stone machinery world by storm. 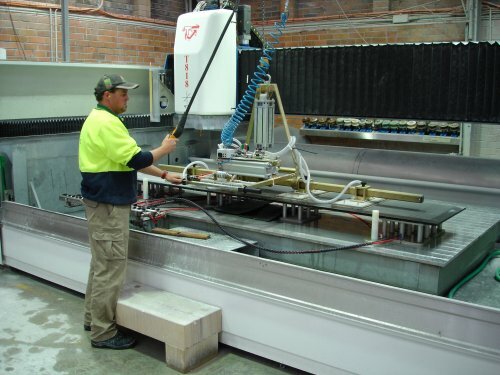 With over 25 years combined experience, the Poseidon team know precisely what is needed in order to make the process of cutting and shaping stone easier, faster and more cost effective. The company has expertise in CNC stone machinery, stone edge polishing machines and stone cutting bridge saws. The team is justifiably proud of the new range of equipment, which has already been well-received within the industry. The key products of the company include the Brilliance Slab Polisher, The Vanquish Waterjet CNC Saw and the Goliath Block Saw. All these machines are combined with innovative design features to create a new class of equipment for all those working with stone. Its new Odeon Bridge Saw, which features a touch-screen for ease of use and precision, is made in the US, but features a specialist 20 HP motor made in Italy.